There is not a truer statement ever spoken. Giving back to God has been at the heart of his priesthood, and now is at the heart of his work. Father John is a premiere fundraiser and he has to be in his role as CEO of Catholic Charities of the Archdiocese of Washington. Catholic Charities serves more than 160,000 people through63 programs in 48 locations throughout the District of Columbia and Montgomery, Prince George’s, Charles, Calvert and St.Mary’s Counties in Maryland. You can plainly see that Catholic Charities does God’s work for Catholics and Non-Catholics in Our Town. 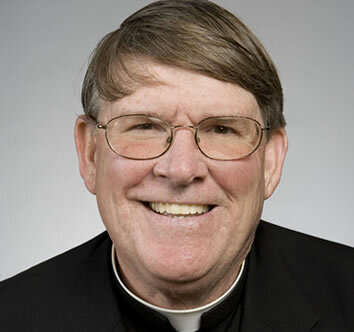 In addition to his mission with Catholic Charities, Washingtonians know him as a champion of good causes, beloved Parish Priest, Board member of Don Bosco Cristo Rey High School, Monsignor, and 2012 Washingtonian of the Year. He sits on close to 20 boards, has served as Priest at 3 parishes in his career, and received over 15 prestigious community and educational awards. As Andy introduced him, Father John is truly a Premier Priest in Our Town. If you’ve ever wondered why someone would chose the vocation to be a priest, we’ll tell you in this episode of Our Town. Father John talks about his family, his inspiration and his calling to the priesthood. Growing up in a family of 13 children prepared him for his work, Father John said, “I was blessed because of my family, I was used to working with all ages and learning to give and take and work things out,” as stated in the 2012 Washingtonian article, he has a “keen desire to pass on the faith.” It’s a beautiful story of the living example provided by his parents, Deacon Clarence and Kathleen Enzler. Here is another example of his inspiration, Father John, as a boy, would accompany his dad to church each day, one of his clearest memories is of his father handing the coat off his back to a homeless man they met on the way, “You witness that and you say, ‘that’s how you’re supposed to live, how you take care of the poor, not give them leftovers, but give out of your own blessings,” he said. Locally born and raised, Monsignor Enzler, who prefers to be called Father John, is a graduate of Our Lady of Lourdes School in Bethesda, St. John’s College High School in Washington, and Mount St. Mary’s Seminary in Emmitsburg. We hope you have enjoyed this week’s episode our “Our Town” with Andy Ockershausen and Monsignor John Enzler, President and CEO of Catholic Charities of the Archdiocese of Washington. We invite you to listen to each new episode of Our Town as they roll out over the next several months. You can subscribe to the Our Town podcast on iTunes, Google Play or if you complete the subscription form in the sidebar to the right, you will be notified by email when the next episode appears here on the website. If you like what you heard, please take a moment to rate and review the Our Town podcast on Itunes. Thank you for listening. Father John, One of this city’s treasurers!! Tonight I was watching the announcement of the replacement supreme court judge by President Trump. Judge Brett Kavanaugh metioned Father John Enzler, and I remember a John Enzler that I went to school with at Saint John’s College High School in Washington DC. And after reading this article on Father John Enzler, what a small world!! Congratulations Father John on your hearing the call and answering God’s call.